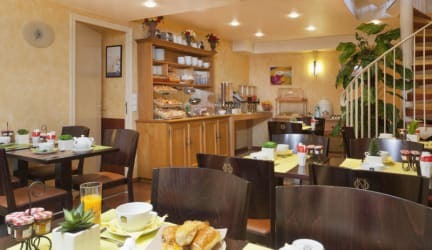 Best Western Nouvel Orleans Montparnasse, Paryż, Francja : Rezerwuj teraz! 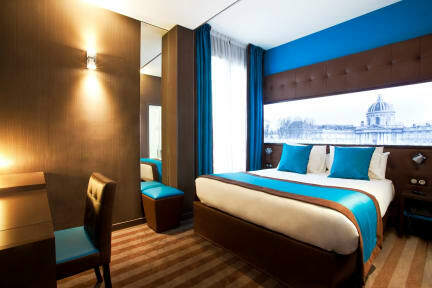 Located in the city center, Best Western Nouvel Orleans is a hotel in the area of 14th Arrondissement, Paris. There are many great attractions nearby, including Cartier Foundation for Contemporary Art, Notre Dame Cathedral, Louvre Museum and Eiffel Tower. Also close by are Tour Montparnasse and Luxembourg Gardens. This 3 star 14th Arrondissement-area hotel in Paris offers air conditioning in public areas, an elevator (lift) and concierge services. The lobby offers coffee, free newspapers and a safe deposit box at the front desk. Wi-Fi, Soundproof Rooms, Air-Conditioning, Flat Screen Television with Satellite Cable, Direct Telephone, Office Space, Room Service, Minibar, Shower, Wake-up Service, Safe, In-room Breakfast Service Available, Balcony for Most Rooms. Located at the crossroads of vibrant, picturesque neigborhoods such as Montparnasse, our charming hotel promises an exciting and unforgettable stay. In the heart of Paris' 14th district, just steps from the Montparnasse neighborhood, the Nouvel Orléans is just minutes by metro to the Latin Quarter (Subway Line #4,direct), the Louvre Museum, Place des Invalides, Notre-Dame Cathedral, les Quais de Seine.